Size greatly varies between species, from the dwarf crocodile to the saltwater crocodile. Species of Osteolaemus grow to an adult size of just 1.5 to 1.9 m (4.9 to 6.2 ft), whereas the saltwater crocodile can grow to sizes over 7 m (23 ft) and weigh 2,000 kg (4,400 lb). Several other large species can reach over 5.2 m (17 ft) long and weigh over 900 kg (2,000 lb). Crocodilians show pronounced sexual dimorphism, with males growing much larger and more rapidly than females.Despite their large adult sizes, crocodiles start their lives at around 20 cm (7.9 in) long. The largest species of crocodile is the saltwater crocodile, found in eastern India, northern Australia, throughout South-east Asia, and in the surrounding waters. The largest crocodile ever held in captivity is an estuarine–Siamese hybrid named Yai (Thai: ใหญ่, meaning big) (born 10 June 1972) at the Samutprakarn Crocodile Farm and Zoo, Thailand. This animal measures 6 m (20 ft) in length and weighs 1,114.27 kg (2,456.5 lb). 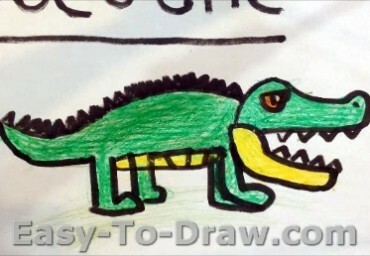 Crocodiles are polyphyodonts and able to replace each of their 80 teeth up to 50 times in their 35 to 75-year lifespan. Next to the full grown tooth there are a small replacement tooth and a odontogenic stem cell in the dental lamina in standby that can be activated if required. 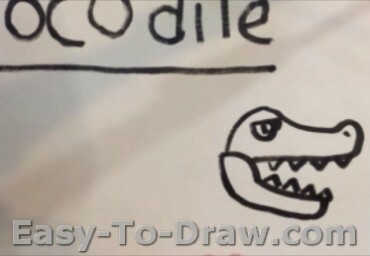 Here are the steps to draw a Crocodile. Enjoy! 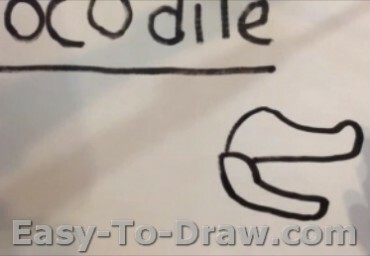 Step 1: Draw the shape of the face and the mouth. 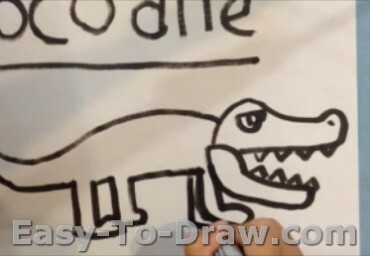 Step 2: Draw its eye and teeth . 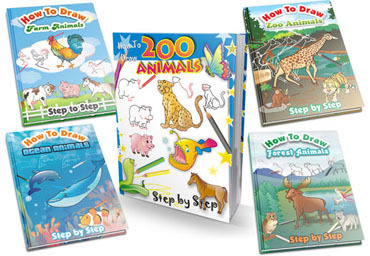 Step 3: Draw the shape of its body and feet with a long tail. Step 4: Color the body and face green. Step 5: Color the eye red, the tummy and mouth yellow. 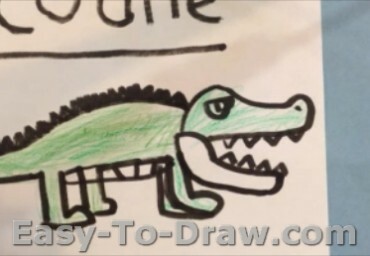 Cartoon Crocodile Video Drawing Tutorial for kids!